Refinement is needed to turn wood into sanded wood, something you can craft with. Refinement has its own tab in the crafting window. Once you have 10 units of rough materials, you can refine them. Whilst you don’t receive any woodworking inspiration points for refining materials, you do have a chance to gain Resins and Trait Materials every time you refine wood. Refining is a great way to receive Resins. They are rare items needed in order to Improve crafted Woodworking items. Woodworking requires you to be at a woodworking station, which can usually be found in towns. In order to craft weapons or apparel, you first have to choose the type of item you want to craft. In woodworking the items are split between weapons: bows, fire, frost, lightning and restoration staffs and apparel: shields. The amount of material you use is partly optional. You can choose to use more sanded wood than the minimum amount to make the item have stronger stats and a bigger level requirement. The higher level items you choose to craft, the more experience you’ll also gain with woodworking skill line. There’s a number of different Racial Styles to craft your items with, which affects how the item looks like. Each race has their own style of crafting and it makes sense that a Nord heavy armor looks different to one that has been crafted by Altmer. Eventually you’ll be able to learn all the racial styles, which come in the form of lore books. These racial motifs can be found as drops and in containers. The woodworking skill line has a bunch of bonuses that make woodworking more convenient. Woodworking is a bread and butter passive skill which gives you access to more woodworking material. By default you can only craft items out of Maple. Needless to say, this is a must have for anyone who wants to craft useful items later on. Keen eye: Wood makes it easier for you to see lumber in the world. It makes lumber glow on the ground. Lumberjack Hireling skill sends you free woodworking items on a regular basis. Quite handy, especially if you don’t spend that much time in game. Wood Extraction is a passive which increases the chances of extracting woodworking ingredients. This includes actual wood and resins, style and trait materials. Carpentry may well prove to be a skill which you want to invest skill points in. It increases the number of researches you can have simultaneously and reduces the research time. If you want to learn the last, eighth, trait for a piece of gear, it’s going to take 32 days without this passive. Resin Expertise improves the chances that you can successfully improve an item. Investing points in this passive skill is definitely worth it at the higher quality levels, because you’ll be able to save valuable resins this way, giving you the ability to improve a greater number of items overall. Lumber in the world will be easier to see within 20/30/40 meters. and possibly other items every day. Reduces research time by 5% and allows the research of 2 items at once. Increases the chances of improving items with Resins. Woodworkers, just like smiths and tailors can apply Traits on the items they craft. Traits are bonuses which are applied at the creation process and there’s separate Traits for both weapons and armor. Applying traits requires you to know the Trait and have the Trait Material. Crafters can learn new traits by researching. Reduces cooldown of weapon enchantments. Increases weapon and spell critical values. Increases total armor and spell resistance. Increases weapon skill line experience. Increases Increases armor and spell penetration. Increases Increases weapon attack speed. Increases resistance to critical hits. Reduces the cost of sprinting. Increases armor skill line experience. You can learn new Traits by researching. Traits researches are specific for each gear piece, meaning if you research a trait for Bows, you will not learn that trait for any other item than the Bow – you’ll have to separately learn the traits for Staffs and Shields. Research is a process that takes a long time, by default 6 hours, and you can only have one research active per profession. The research time for a gear piece doubles after each research, so the second trait your research for the same piece of gear takes 12 hours, the third 24 hours and so on. The final trait research will take 32 days by default. You can reduce the time it takes to research traits and increase the max number of active researches with the passive skill Carpentry, though. To learn a trait, you must have an item with that specific trait and then choose to research the trait off of that item. In the process, the original item is destroyed, and at the end of the research you learn the trait and gain experience in the crafting skill line. Deconstruction is a way to break down weapons and apparel. Every time you deconstruct a weapon or apparel, you receive crafting materials and potentially Resins for woodworking, Trait Material or Style Material. Deconstruction is also a great way to gain experience in woodworking. Instead of selling all the looted weapons and apparel to a vendor, you might want to consider deconstructing them instead. To improve an item in woodworking, you need Resins. 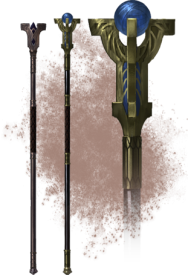 They are special items which can be found as drops, but the main source of Resins are Deconstruction, Refinement and your Hireling passive skill. There are different types of Resin, and it’s a much more demanding process improving an item to Legendary quality than it is to improve it to Fine quality because the higher quality Resins are much, much rarer. If you want, you can improve a single item multiple times, eventually improving it all the way to Legendary, but you do need to have all the different kinds of Resin to do this. Based on how many Resins you use, your chance to successfully improve an item increases. Improving items is not risk-free, though. If you fail to improve an item, it will be destroyed. You can choose to use between one and five Resins. By default your chance to improve an item is 20%. This chance can be improved by using more Resins and by investing skill points in the woodworking skill line. You can completely eliminate the chance of failure by using the max amount of Resins.